Think you're getting a great deal on Black Friday? You should see how much Walmart is "saving." This Black Friday, legions of shoppers will throng to their local Walmart in frenzied pursuit of holiday deals. But it turns out that Walmart has saved the sweetest deals for itself. 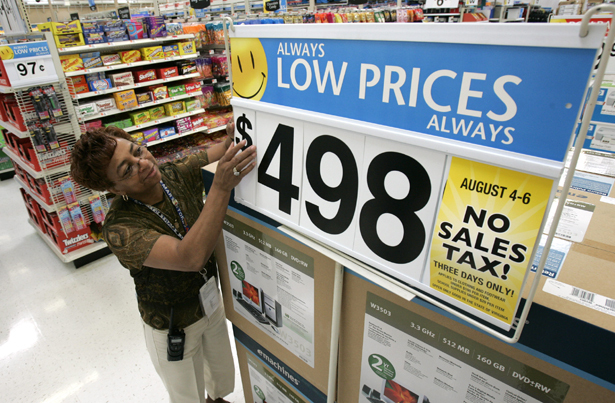 In a recent analysis of Walmart’s tax spending, Americans for Tax Fairness (ATF) found that the company “avoids $1 billion a year in taxes” through federal loopholes, and various political shenanigans drive this always-low tax rate: the big-box giant is absorbing government subsidies both directly and indirectly, through its retail operations as well as its ingenious accounting methods. Overall, the retail giant can evade taxes through overseas accounts, on one hand, and raid the public trust on the other by capitalizing on the benefits system. The losers in Walmart’s tax scheme are the working-class consumers who think they’re getting a good deal by elbowing through the mob surrounding the Xbox floor display. They’re being secretly robbed as the country’s pre-eminent retailer shields hundreds of millions of dollars of revenue from the tax system through creative, perfectly legal strategies to reduce its liability. ATF estimates that through its globalized business structure, “Walmart is avoiding paying U.S. taxes on $21.4 billion in offshore profits.” And its reach overseas is expanding, with investment in new operations in Africa, Asia and Latin America. So Walmart, which is known to be a major lobbying force on food stamp issues in Washington, appears to be suppressing wages and letting Uncle Sam pick up the slack. And it profits further as a purveyor of subsidized food: of every dollar of food stamps spent in this country, roughly 18 cents is spent at Walmart. And according to critics, the benefits of food stamps go primarily to the company and not to customers, whose food security is constrained by the dependence on welfare subsidies that Walmart indirectly promotes. Walmart (which has not yet responded to The Nation’s request for comment) has generally defended its business and labor practices against accusations of worker exploitation and tax dodging by arguing that the vast majority of workers earn more than the minimum wage and have a chance to qualify for benefits, and that its compensation practices are “comparable” to those of similar large employers. Adding to those projections of Walmartization’s social costs are the potential environmental effects of Walmart’s carbon-intensive, fossil-fuel-based mass retail structure. Yet this is not simply a matter of boosting poorer economies in which Walmart operates. According to ATF, this has a corrosive effect on the global economy by driving the structural inequalities that Walmart has capitalized on. If the company is given free rein to offshore profits, the group argues, “Walmart’s suppliers with manufacturing facilities in low-tax countries will cut their costs; and the company and its suppliers would be able to increase US tax avoidance by establishing subsidiaries in offshore tax havens and use accounting gimmicks to shift income to those subsidiaries.” This pattern of chasing cheaper territories as tax havens shows how the global financial trends mirror the “race to the bottom” in the production chain. Though analysts have debated the structural effects of globalization on “development,” labor advocates point to a manufacturing and trade structure that fuels social inequality and perpetuates poverty wage jobs and exploitative working conditions in the Global South. Since Walmart seems hell-bent on avoiding contributing to any of those revenue needs for social programs, American shoppers should be sure to stretch every dollar this holiday season—you may need a little to fall back on in the coming months.